The authors present a unique case of bilateral isolated choroidal melanocytosis in an annular pattern that, to our knowledge, has not previously been described. A 44-year-old asymptomatic American Indian woman presented with bilateral choroidal hyperpigmentation in an annular pattern for 12 clock hours around the peripheral retina. No other uveal, scleral, or cutaneous hyperpigmentation was observed. Optical coherence tomography did not demonstrate choroidal thickening or subretinal fluid. The diagnosis of bilateral isolated choroidal melanocytosis was made. Long-term follow-up of this patient and other cases described in the literature is necessary to determine the malignant potential of these lesions. Isolated choroidal melanocytosis was first reported by Augsburger et al., who described the presence of unilateral patchy regions of choroidal melanocytic hyperpigmentation in 11 Caucasian individuals without scleral or cutaneous pigmentation.1 Only five cases of bilateral isolated choroidal melanocytosis have been documented. Of these, only one case has had more than 8 clock hours of choroidal involvement. We report a unique case of diffuse bilateral isolated choroidal melanocytosis presenting as confluent annular pigmentation and the only American Indian woman who has been reported with this condition. A 44-year-old American Indian woman was referred for evaluation of abnormal choroidal hyperpigmentation first noted on routine exam 2 years prior. On presentation, she reported blurred vision of the left eye but was otherwise asymptomatic. Her medical history was remarkable for rheumatoid arthritis with dry eyes, for which she had been treated with hydroxychloroquine and later etanercept. On examination, visual acuity (VA) was 20/15 in the right eye and 20/60 in the left eye. No hyperpigmentation of skin, conjunctiva, sclera, or iris was observed. There was diffuse superficial punctate keratopathy across the left cornea that accounted for decreased VA. External and slit-lamp exam were unremarkable. Dilated fundus examination revealed bilateral melanocytic choroidal hyperpigmentation that extended in a continuous annular pattern for 12 clock hours around the peripheral retina. Hyperpigmented regions did not involve the macula, and there was no overlying drusen or orange pigmentation. 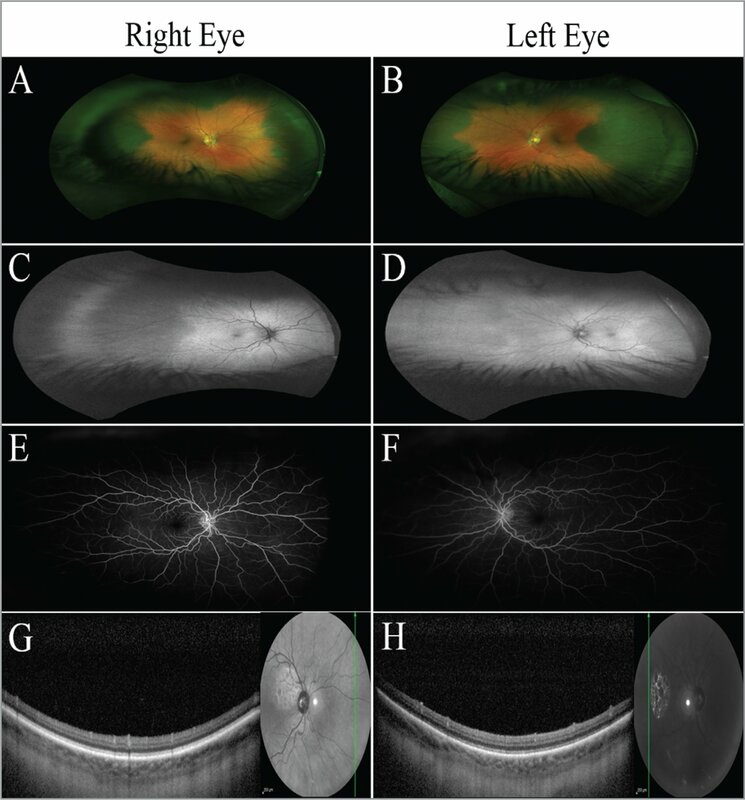 Fundus autofluorescence imaging did not reveal autofluorescence in either eye, and fluorescein angiography revealed a normal angiographic pattern in both eyes without hyperfluorescence in pigmented regions. Optical coherence tomography of the pigmented regions in both eyes did not demonstrate significant choroidal thickening or subretinal fluid, and overlying retinal layers appeared normal. No hydroxychloroquine toxicity was seen. Ultrasound of the eyes did not show any evidence of choroidal thickening or mass (Figure 1). Color fundus photographs demonstrated diffuse bilateral choroidal hyperpigmentation in an annular pattern (A, B). Fundus autofluorescence imaging demonstrated a lack of retinal autofluorescence (C, D). Fluorescein angiograms displayed normal vessel patterns without hyperfluorescence in pigmented regions (E, F). Optical coherence tomography of the peripheral retina showed normal choroidal thickness and architecture in both affected and unaffected regions. The overlying retina appeared normal, and there is no subretinal fluid (G, H). The differential diagnosis for bilateral choroidal melanocytic lesions includes paraneoplastic bilateral diffuse uveal melanocytic proliferation (BDUMP), bilateral choroidal nevi or melanoma, ocular or oculodermal melanocytosis, and isolated choroidal melanocytosis. BDUMP, choroidal nevi, and melanoma all demonstrate variable choroidal thickness and may be associated with subretinal fluid and orange pigmentation, none of which were observed in our patient.2 Ocular and oculodermal melanocytosis are congenital conditions that present with hyperpigmentation of the choroid, as our patient exhibited, but also involve increased blue-brown pigmentation of the sclera, iris, and ciliary body.3 Hyperpigmentation of the periocular skin is also observed in oculodermal melanocytosis. In the absence of other sites of pigmentation, our patient's diagnosis was bilateral isolated choroidal melanocytosis. Only five cases of bilateral isolated choroidal melanocytosis are described in the literature, involving one African American, two Asian Indian, and two Caucasian patients between the ages of 24 and 60 years. In all cases, patients were asymptomatic. Kovoor et al.4 described a case of a 40-year-old Asian Indian woman who was diagnosed with bilateral isolated choroidal melanocytosis restricted to the posterior poles. Fine et al.5 reported a case involving a 43-year-old Asian Indian woman who had bilateral choroidal hyperpigmented lesions that, similar to our case, had 12 clock hours of pigmentation with little macular involvement. However, the edges of this patient's lesions were feathered and discontinuous. Velazquez-Martin et al.3 described two cases of multifocal bilateral choroidal hyperpigmentation in Caucasian patients aged 60 years and 58 years who were followed for 6 years and 2 years, respectively. They continued to be asymptomatic without visual abnormalities or lesional changes throughout follow-up. The most recent case, published in 2016 by Mason et al.,6 described a 24-year-old African American woman with flat, bilateral choroidal hyperpigmented lesions. Her lesions were patchy and variably sized with 8 clock hours of involvement in the right eye and only 3.5 clock hours in the left eye. None of the patients in these cases demonstrated choroidal thickening, orange pigmentation, or subretinal fluid. Ours is the first case to show a bilateral 360° confluent annular pattern of isolated choroidal melanocytosis. It is difficult to determine if these lesions are congenital or acquired, and the potential for malignant transformation in individuals with bilateral isolated choroidal melanocytosis is currently unknown. Patients with oculodermal melanocytosis have significantly increased risk for developing uveal melanoma (one in 400 Caucasians) and require close monitoring for lesional changes.7 The risk for cancer has been postulated to be influenced by whether true melanocyte proliferation is occurring or whether hyperpigmentation is solely the result of increased melanin production.3,8 Due to the benign course of isolated bilateral choroidal melanocytosis, there has been no opportunity for histopathological study to determine the exact etiology of hyperpigmentation. Long-term follow-up of patients with this condition is important to further characterize it and the risk it poses for malignancy. From University of Michigan Medical School, Ann Arbor, Michigan (KDH); and the Department of Ophthalmology and Visual Sciences, W.K. Kellogg Eye Center, University of Michigan, Ann Arbor, Michigan (HD, VME). Funding and support for this study were provided by the Richard N. and Marilyn K. Witham Professorship. Address correspondence to Hakan Demirci, MD, Kellogg Eye Center, 1001 Wall St., Ann Arbor, MI 48105; email: hdemirci@med.umich.edu.